I’ve always been more a gold girl than silver; no matter how nice the jewellery, silver just makes me think of black leather thong pendants and curly Wiccan jewellery. Actually my gold obsession is pretty intense, even the metallic trims on jackets and bags need to be gold for me to fully appreciate them – which is nigh on possible most of the time, and one of the reasons why Versace is so amazing. One silver thing I’ll always have a soft spot for is leather – silver leather says Shampoo, Spice Girls, Kenickie and a million other 90s girl band style-influencers. With Autumn/Winter 2012’s space-age, sci-fi, silver surferish futuristic trend, there’s no shortage of high-shine leather around – and a few other silvery bits that are making me rethink my metallic choices. 1) Stylestalker Heavy Metal Jacket, $204 – Virtually transforms you into Carrie or Jacqui as soon as you slip it on. 2) ASOS Major Tassel Loafer, now £18 – A non-spaceman way of doing silver. 3) Acne Free Metal Boots, £460 – A stylish spaceman way of doing silver. Equal parts Bowie. 4) Jermey Scott Silver Smile Sunglasses, £158 – Pretty sure Carrie and Jacqui would like these. 5) Topshop Neoprene Silver Backpack, £28 – Fill with powdered space food, furled-up flag and a good book. 6) Marc Jacobs Silk-Duchess Dress, now £279 – What Courtney Love would wear for a gig on the moon. 7) Maria Francesca Pepe Two Finger Ring, £60 – If anyone is going to sway me towards silver jewellery, it’s MFP. Ah, Jas Mann. If you want more of the intergalactic space hopper (his words, not mine), I happened across another Smash Hits biscuit tin interview. It’s amazing. He really does like silver, huh? Here! Hahaaa! 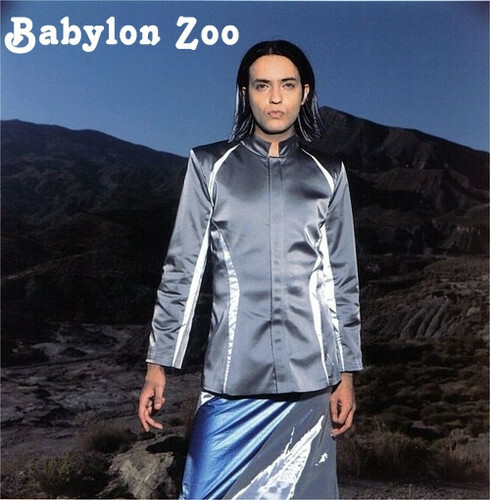 I love this, because every time I wear my Model’s Own silver metallic foil nail polish (which is often, let’s face it it goes with everything) my boyfriend says I look like Babylon Zoo. And apparently that’s not attractive! Oh well.